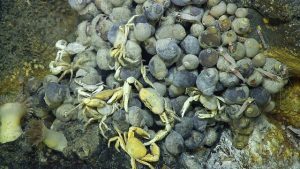 Ongoing research supported by the GOBI-IKI project has contributed to the publication of a seminal article on the scientific rationale for the protection of active hydrothermal vent ecosystems from deep-sea mining. The article summarises the ecological vulnerability of such ecosystems whilst emphasising the societal value of vents remaining untouched, as they represent a library of enzymes and genes with potentially revolutionary and as-yet unimagined applications for medicine, biotechnology and industry. It further argues that this intrinsic value is far greater than that which could be achieved by exploiting the vents’ finite mineral content, especially as mineral extraction is likely to be severely destructive and with unforeseeable consequences to the ecosystem. Given that active vents are recognised as vulnerable by multiple international instruments, a call is made to those presently drafting the International Seabed Authority’s Mining Code to apply a strict precautionary approach to the regulation of deep-sea mining at such rare and unique sites. Submarine Ring of Fire 2014 – Ironman. Courtesy of NSF/NOAA, Jason, Copyright WHOI. The article is published as ‘open access’ and can be downloaded here.